How do I schedule Pins to publish on my Facebook profile? Cross-promoting on social media is a breeze! See how to publish Pins on your Facebook profile here. Sending your pins to other social networks can be a great way to increase engagement! To get started we've included how to connect your personal Facebook Profile and some helpful information when cross-promoting on social media. Looking to schedule to a Facebook Page or Twitter, instead? Go to your Pinterest Settings page and scroll down to Social Networks to connect your Facebook. Note: Pinterest currently only supports personal Facebook accounts. However, we offer our own integration with Facebook to enable you to publish to a Facebook Page. 2. You'll need to give Pinterest sharing permission before sending your scheduled pins to Facebook. 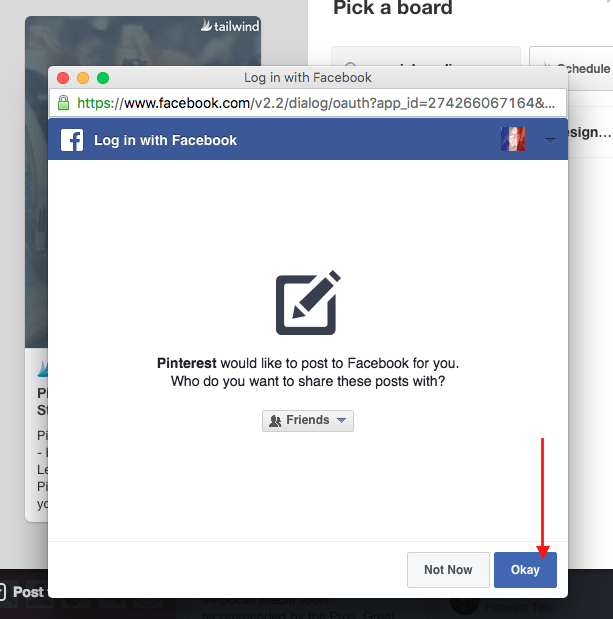 To do this, save something on Pinterest and click their Post to Facebook checkbox. 3. Pinterest will ask for permission to post to Facebook for you. 4. Just click Okay, and you're set! 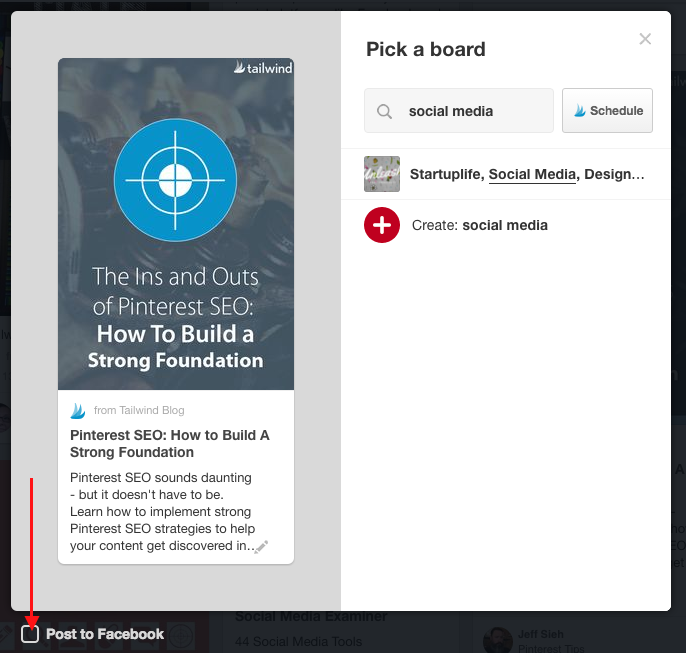 You can now send your scheduled pins to also post Facebook when they publish to Pinterest. 5. Now that you've synced your Facebook, click the checkbox next to the Facebook logo on a draft or scheduled pin to also send this pin to Facebook. Helpful Tip: Did you just sync your account to Pinterest but can't yet schedule your pins to Facebook? Try Refreshing Your Username to enable this feature!